Imagine for a moment the silence of wilderness, the forest covered with a soft bed of snow absorbing noise from surrounding roads. All is calm. The only sound coming from the sleigh runners gliding over the surface and the dogs, concentrated and working in perfect tandem. 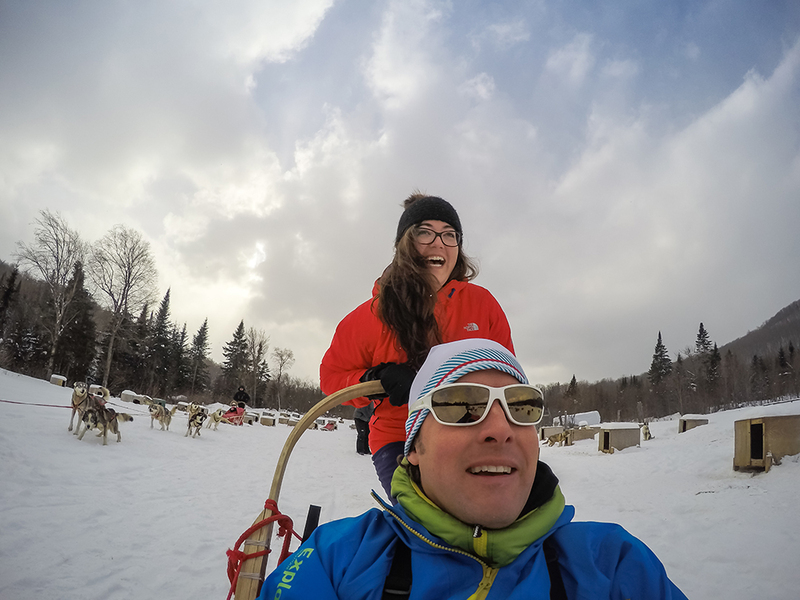 An escape from the daily chaos of reality and a way to reconnect with nature, dog sledding is an experience to try at least once in your life! Some archaeologists trace the Canadian origins of dog sledding back to the Thule Inuit who, by the year 1000 BC, used it as a means of transport for trade. In the 1870s, the Royal Canadian Mounted Police (RCMP) even started using this mode of transport in order to patrol the northern wilderness. Although more efficient modes of transportation were invented to conquer Canadian forests – snowmobiles! 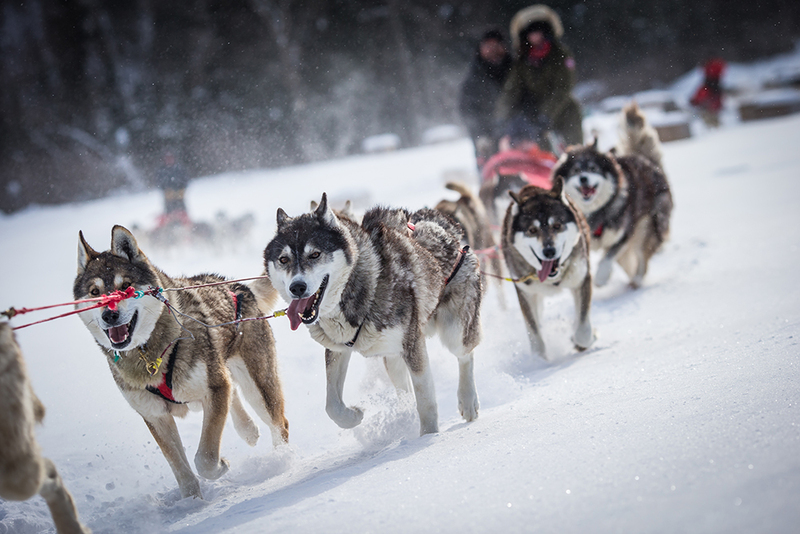 – This culture of camaraderie between men and dogs has persevered in the Canadian spirit and has turned into a sport that promotes endurance, loyalty and intelligence. 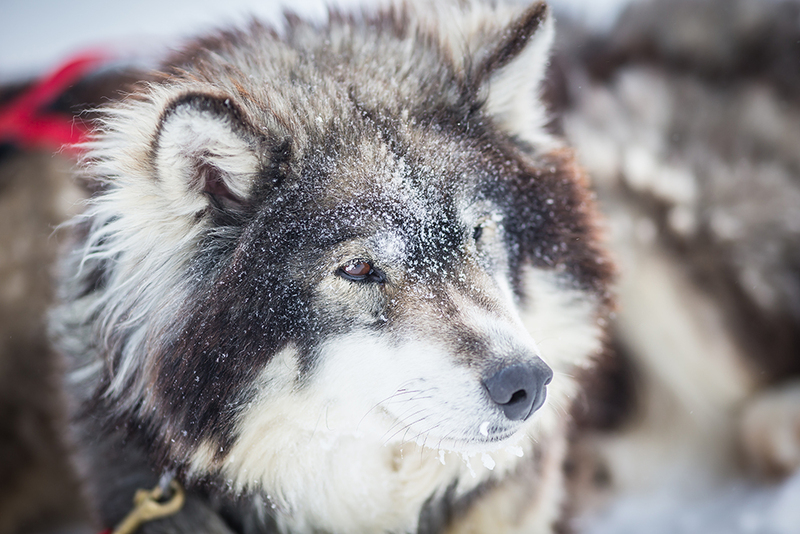 Dogsledding now offers an unforgettable experience that is also respectful of the environment. 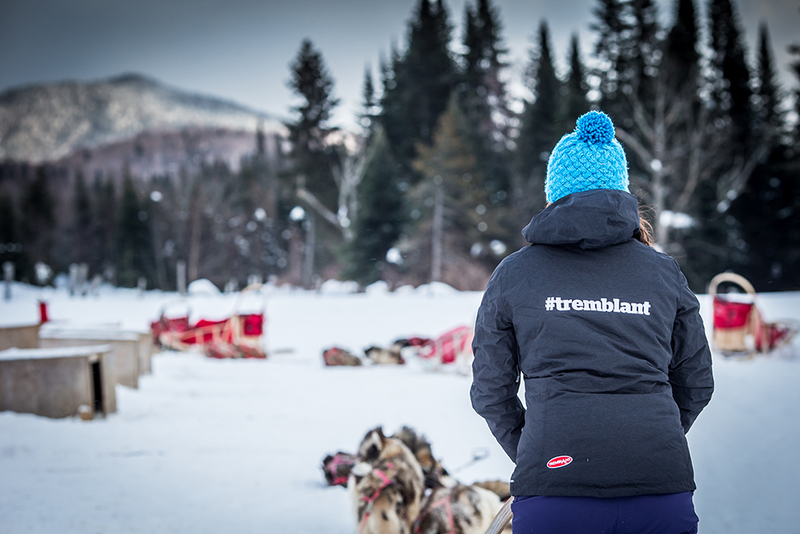 The #tremblant team recently visited Mountain Adventure, a partner of the Tremblant Activities Center, to discover dog sledding and share with you their experience. The journey begins with a shuttle transfer from the pedestrian village, crossing beautiful country roads and going through small wooded paths. Upon arrival, you find yourself in the forest, being welcomed by vigorous barking. The sound is quite surprising! You see about seventy dogs anticipating a new race in the forest, ready to excel. Do not make the mistake of underestimating the strength of these cuddly creatures; they are powerful 4×4 in the snow! 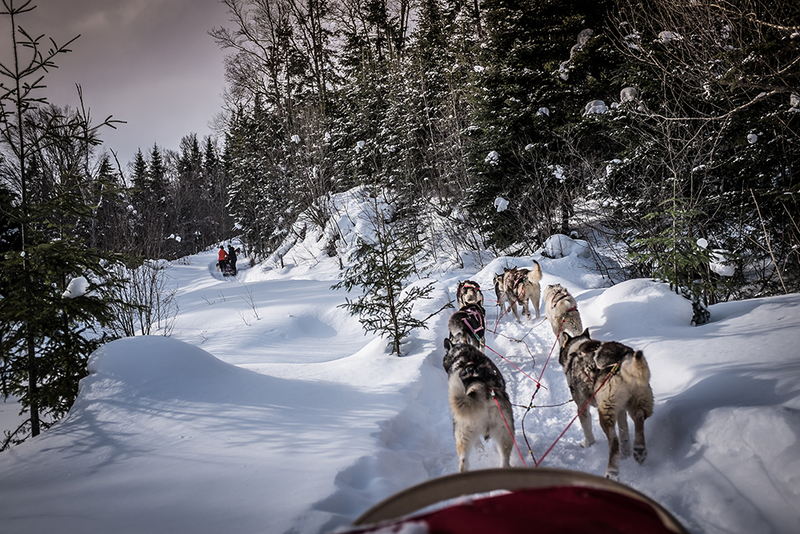 Before embarking on the excursion, you are first introduced to dog sledding driving techniques. 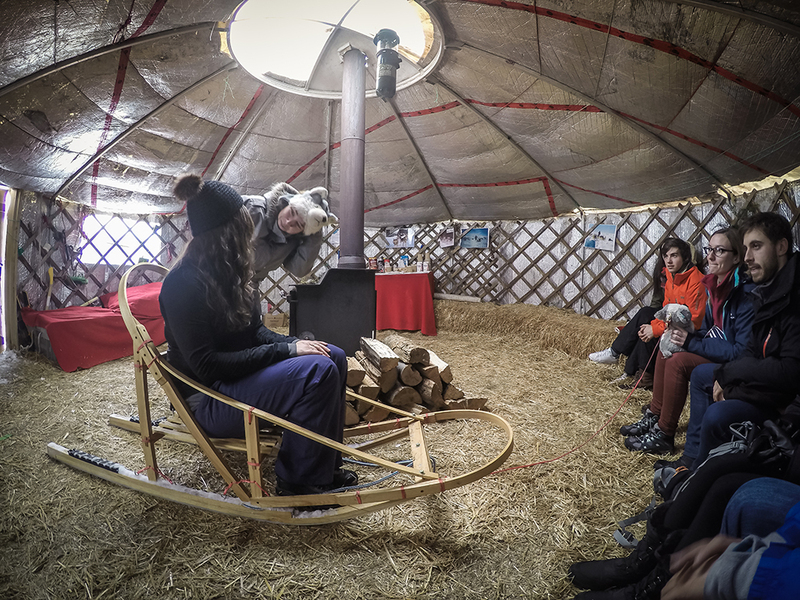 Warm in a yurt (large Mongolian style wood heated tent) they teach you, using interactive demonstrations, how to drive your own sled. Our team was greeted by a friendly woman – with a nice husky hat – who used a miniature sleigh for her presentation. Here you get to understand the basics: cords, dogs, weight shift, brake, etc. Finally, the time comes when you take control of the sleigh. Dogs, still very excited, bark in chorus while you get ready. Passengers are comfortable: one well seated in front and the other standing on the feet of the sled. Go! The anchor is lifted and you feel the full force of these animals suddenly propel you forward. The route will take you along a variety of trails, through valleys and mountains with nice turns, climbs and descents. By the first bend, the driver realizes that he cannot just let himself be pulled. He must help the sled playing with his weight, balancing either to the left or right, running a little up the slopes (cardio moment!) and pressing the brake at key moments. The brake, a metal plate with teeth, is important to maintain speed while going downhill and also in some tighter turns. Please learn from our team’s mistakes and try not to confuse the ground and the brake! Result: a Superman-like position with feet flying off the ground and hands still on the sled … True story! As evidenced by the author of this blog, who still has snow in her coat, and her passenger, who’s still laughing about it! After a short time, confidence sets in and you start to really enjoy the natural surroundings. Halfway during the excursion, you can change the passenger/driver roles or maintain them. Then, without much delay, you begin the second part! On your return, the fatigued dogs lie down almost immediately. You can take this opportunity to go pet them and take pictures. 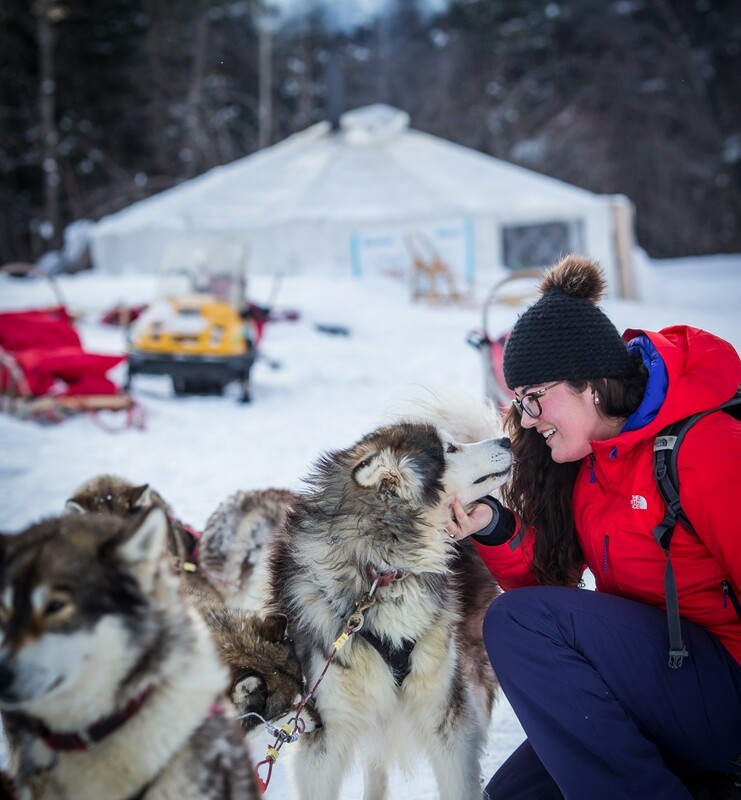 To complete the experience, you are invited to return to the yurt for a snack and, perhaps, meet adorable puppies. During our team’s visit, the ride home was filled with funny stories and tired people! 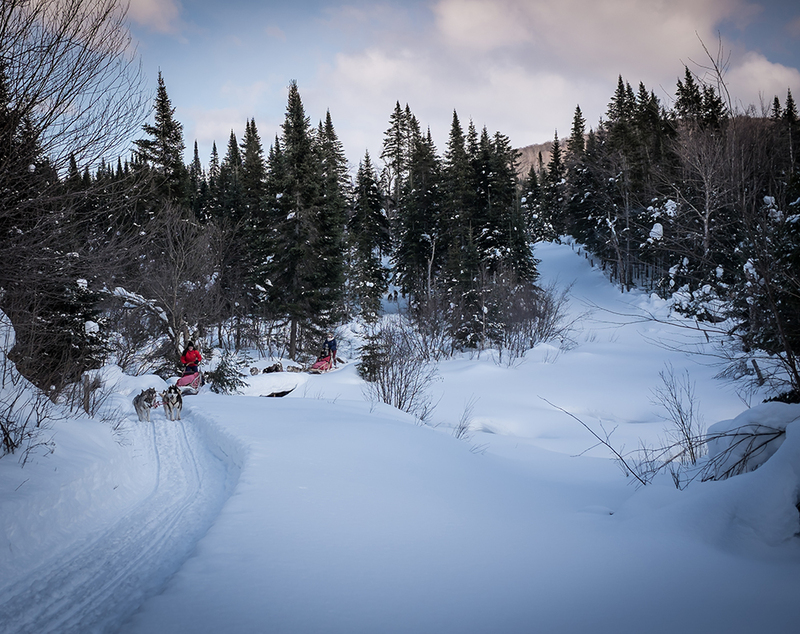 For more information on dog sledding activities offered by the Tremblant Activity Centre, see our website! An extra weekend to enjoy the slopes! The calm after the storm, enjoy it!